With its dreamlike scenery, Old World historic centers, and generally languid pace of life, Italy has to be one of the most romantic countries in the world. Travelers on first (or second) honeymoons flock to the Amalfi Coast and Venice, but all of the Bel Paese lends itself to leisurely strolls hand-in-hand, candle-lit dinners in tiny village squares, and stolen kisses from the nearest scenic overlook. Though Florence can be decidedly unromantic during the peak season, when the city is packed with tourists and so hot and humid that the locals - who know better - have all fled to the nearest seaside resort, during the shoulder seasons in spring and fall when the weather is more forgiving and the crowds less thick, this Tuscan destination seems made for love. 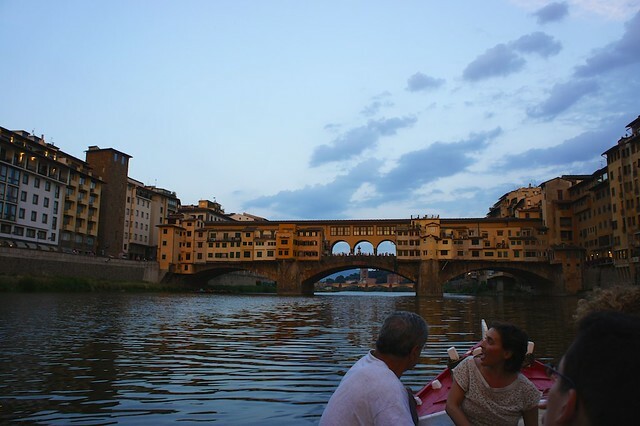 Here are few of the most romantic spots and experiences in Florence, for lovers old and new. 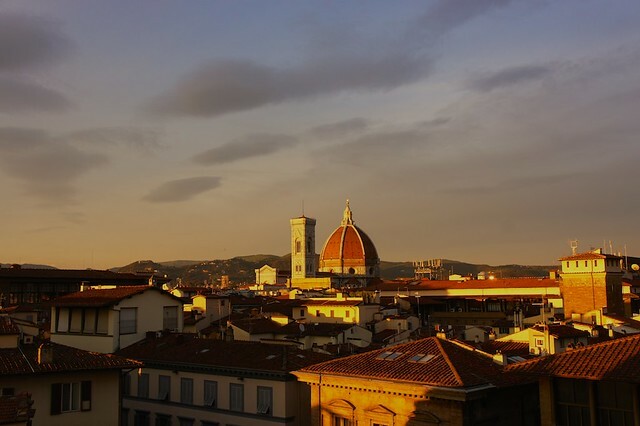 Florence is full of excellent trattorias serving traditional Tuscan dishes, some bustling and some quiet. But if you are looking for the most romantic venue for your meal, book the Lovers' Corner table at the Belmond Villa San Michele just outside the city. This hilltop 15th century villa has a facade attributed to Michelangelo and a view over the Florentine skyline that is just as much a work of art. The semi-private Lovers' Corner table, with its combination of privacy, panorama, and gourmet cuisine, has been the site of many a proposal. Though the most famous park in Florence is the Boboli Gardens behind Palazzo Pitti, we like the almost unknown - and for this reason, much quieter - Bardini Gardens in the Oltrarno. 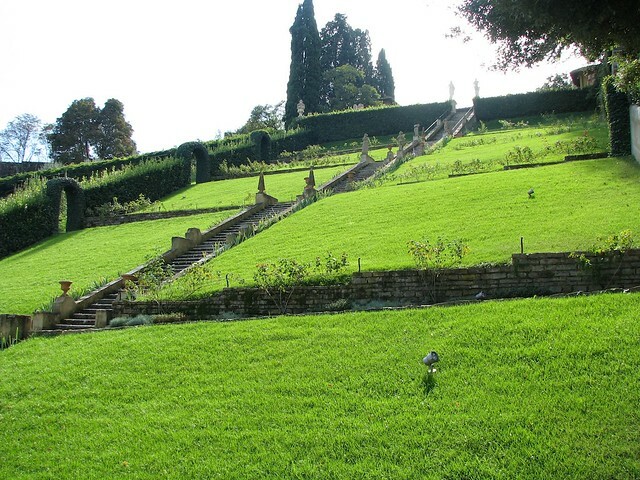 This 16th century park acquired a Baroque staircase a century after its creation, which leads to the top of the terraced park where the scenic overlook above Florence is perfect for a romantic pause. The adjacent Villa Bardini also hosts musical concerts during the year for classical music lovers who want an unforgettable venue. The historic pharmacy and apothecary in Santa Maria Novella is probably the oldest in the world, founded in the 13th century and open to the public since the 1600s. The pharmacy still prepares its wares using traditional methods and original recipes of the Dominican monks who founded it, and in the antique vaulted rooms you can choose from a number of wonderfully scented bath and body products, including soaps, colognes, and lotions. The perfect place to choose bath oils or scented candles for a romantic evening. There is nothing more symbolic of eternal love than a ring, and Florence's tradition of artisan goldsmith workshops means that this is the perfect city to purchase a golden memento. Steer clear of the pricey shops on the Ponte Vecchio, and head instead to the more storied artisans like Giuliano at the Cecchi Carlo shop in Piazza Santo Spirito, who has been making handcrafted gold pieces for 50 years, or young artists like Negar of Naa Studio in the Oltrarno, who combines traditional quality craftsmanship with contemporary design. The Uffizi is one of the most overwhelming museums in Europe, for sheer size and quality of collection. But don't get distracted by all the Botticellis and Michelangelos...head directly to Titian's “Venus of Urbino”, just as erotically charged today as it was when it was unveiled to reactions of shock and scandal in the 1500s. Venus' frank and shameless “come hither” look should set fire to any couple's ardor, and you can feel free to skip the gift shop on your hurried way out.